The day finally arrived to experience a middle distance Ironman race and i wasn't disappointed with this event. It had great atmosphere, good competition and some hard racing with about 1900 athletes entered. This is a beautiful part of France and the weather was ideal. Taking down an 800 calorie breakfast was interesting and so was discovering I had somewhat outgrown my wetsuit from last year! However the goal of this race was to finish strong and positive, test out the nutrition strategy with a view to making the full distance Ironman Nice next month a less daunting prospect. 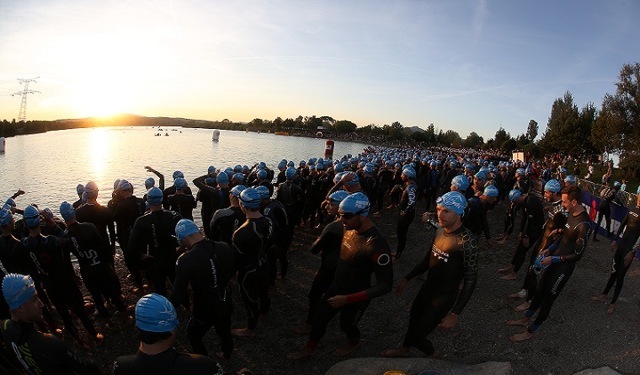 (1.9km) - Set in a lake about 30mins by car north of Aix which made the logistics of the event abit cumbersome due to having two transition areas, however it was good nonetheless. The usual washing machine affair during the first half, stayed calm, got some space and focused on good navigation and preserving my energy. Fortunately no contact. (90km) - Felt pretty good after the swim but was cautious not to push too much on the bike, wanted to finish strong on the run. Time flew past on the ride and I learnt to be careful pacing against others since many were doing the relay and were much fresher, it was reasonably hilly with one 500m climb about 80km in, but what goes up must come down and there were some fantastic fast downhill sections afterwards. Finished in good shape for a strong run. (21.1km) - Oh dear....legs feel great, lots of energy, however my lungs seemed to have stopped working. It was about 24degrees but felt alot hotter for the 4 x 5km loops in the centre of town. I'm not sure what my problem was, i now suspect the wetsuit was far too tight and compressed my chest and maybe this was the after effect but nevertheless I had to back right off and fortunately the great atmosphere from the crowd around the course (and my lovely wife) meant i finished. Whilst I would have liked to be 25mins quicker on the run, I know this will serve as motivation for the next one. A big thank you to MSTC whose coaches have been very helpful the past 12 months. 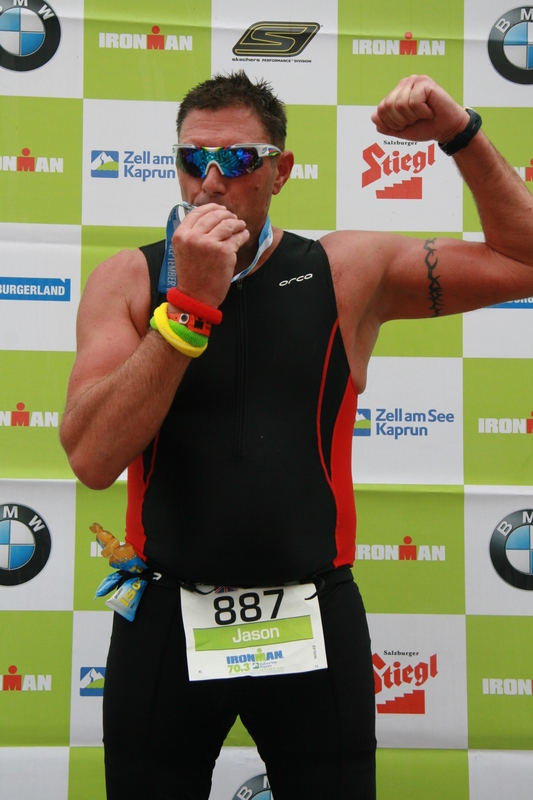 Training gone well for the finale, my first half iron man, the 70.30 Austria. The last three months swimming and cycling came on leaps and bounds since I joined the MSTC with their coaching and help from other club members. Open water swimming, new and much enjoyed, albeit after a little trepidation! Arrived 29th August in stunning Zell-Am-See so had three days to orientate ourselves with warm and sunny weather. Spent some time finding our bearings, finding Transition point and the more important, Finishing line. Cycled around the lake to get a real feel of the land. 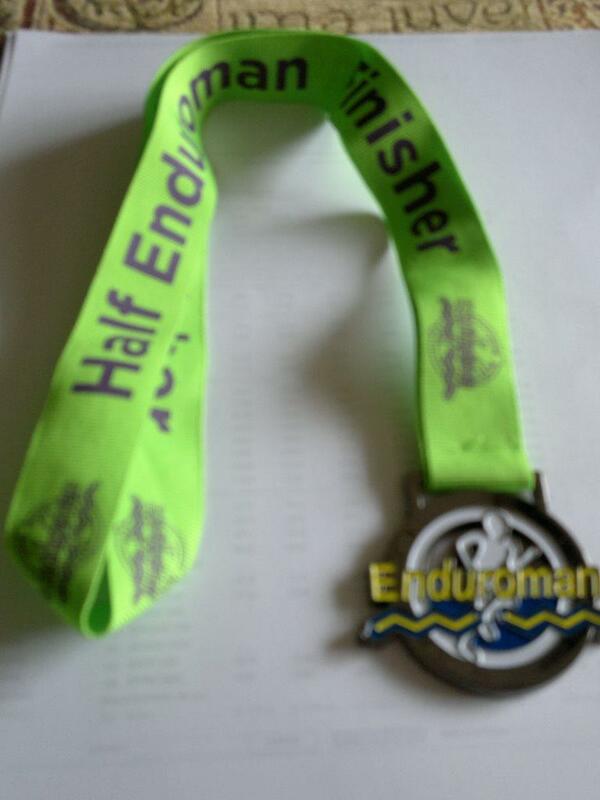 Finally, race day:- Rained through the night and all through the swim and cycle, but did stop for the run! Would highly recommend this venue for a 70.3 race for achieving a PB as bike section not too hilly and a flat run. After all the recent good weather, it was a bit of a shock when we awoke to pouring rain for the 4th Middle Distance Race. The long course was exactly the same format as in previous years, but this time there was a short distance option, and in the end the majority of competitors took it, no doubt influenced by the weather. 13 people and one relay squad went for the long course, 18 and one relay team for the short course, 6 just did a swim, and 4 others did other distances (a bit of a mixture). The race got under way at 7.45am, just a few minutes late, to allow time for the EGM to vote for a change in the club constitution. Once done everyone got in the water and there was a short countdown to the start. As the countdown got down to 3 there was a flurry of activity and Steve Mac dived in to just make the start in time. There were 43 swimmers at the start, so there was plenty of action, but it was Dave Gorley who rapidly pulled away from the field, and completed the 1900m swim in 31.49, nearly 3 minutes ahead of Neil Giles, who is not exactly slow!! After the swim both Mike John and Steve Mac had to pull out, both were feeling queasy - Mike had a bug and felt too unwell to continue. That was a shame as he has been training well. Everyone knows how challenging the bike circuit is, whether it is one circuit or two. Unfortunately a few people got confused as to whether they were doing 1 or 2 laps and tried to go round again. Next year we will get some more specific signs for this!! If the bike course was not hard enough, Loz and Lucy both got affected by punctures. Lucy did the sensible thing and waited to be rescued, but Loz was on a mission - he just kept riding flat out with a flat rear tyre. He got away with it for a few miles but eventually the tyre came off the rim, and he was riding on aluminium. The bike became difficult to handle and he came off at one stage, and was forced to cut the second lap short in the interests of safety. By the time he came in to T2 - it was not the sight of his wrecked wheel but the sound it was making - I have heard quieter tractors!! Dave Gorley was unaware of Loz's problems and pushed really hard on the run. His winning time of 4h43m35s was excellent but missed out on James Dear's 2012 course record by 14 seconds!! Both John and Kate MacTear kept going extremely well, and ended up winning the BAR race and are the MSTC Middle Distance Champions. Dean showed his strength in recovering from his recent Ironman to still come out and complete the long course in 7h05m - to huge applause. After the miserable weather at the start, the sun eventually came out. By the time David Ricketts got the BBQ going, the conditions were perfect for relaxing and enjoying everyone's company. Leicester Tri Club won the Inter Club competition comfortably - taking back the trophy that we won last year. Thanks to the people who helped out. It is a 'no-frills' race, but everyone mucked in with the registration and body marking, and Roger and Graeme were around most of the day timekeeping. (There may be some errors or missing times, so if there are any corrections please let me know). Also thanks to Tim and Claire and to the guys at the Activity Centre. fortnight before the race, but the first cycle training session on Preston Park Cycle Track ended in severe cuts and bruises when a dog ran into her front wheel at 20mph. The broken skin and limb pains had just 10 days to recover before the race. Very good value for money. About a third the cost of official ironman. Free camping next to swim start and/or cheap rooms provided on-site. The Avon Tyrell Estate hosts the annual Enduroman Ultra Triathlon Festival, with half, single and double iron-distance races plus a 100-mile ultramarathon occurring simultaneously on the same course. Great atmosphere in a picturesque setting. The previous couple of years have seen very wet and windy weather. This year, the conditions were perfect with sunshine and dry roads/paths. Everything is on one site, so you can walk to the race briefing and transition etc. Nice lake swim with repeated laps of just a few hundred metres each. Great cycle through the New Forest with all left turns and not much traffic. Repeated 1.1 mile run laps through the grounds of the estate, on dirt tracks and paths. A relatively small field of competitors with a friendly atmosphere. The women's swim start was 90 mins before the men's. Steve and Jim cheered on Pippa and Helen as they completed their swim. Pippa was one of the first out of the water as expected. Helen had a massive smile as she finished the swim far quicker than she believed possible. Steve's swim was close to the fastest of the day and Jim was middle of the pack as usual. and this helped him secure the fastest cycle time. All four from MSTC completed the cycle without incident (major result for Helen). Challenging run up and down dirt paths within the Estate. Passed the courtyard fuelling station every 1.1 miles to get drinks, gels and cheers from supporters. Speeding past tired athletes, who were doing longer distance events on the same course, helped to keep our spirits up. Enduroman tradition dictates that one completes the final run lap in reverse direction, in order to high-five everyone still out on the course. Jim was pleasantly surprised to find he finished his penultimate run lap without seeing anybody running in the opposite direction (never been in the lead before and never previously won a race). Steve and Pippa completed their runs with good form to produced fast finish times (17th male and 9th female respectively). Helen saved her best for last and she was the 7th fastest female runner (11th fastest female overall).